Post Hatching Development of Male and Female Lactrodectus hasselti indicus. Microscale Topography of Drag-line Silk of Nephila pilipes (Fabricius, 1793). Species Increment of Newly Recorded Genera Stemmops (Aranaea: Therididae) from India. 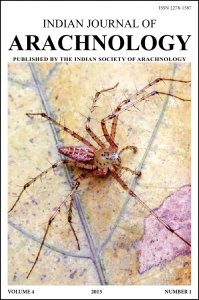 A New Species of the Genus Dolichognatha O. P. Cambridge, 1869 (Araneae: Tetragnathidae) from India. Spider Fauna (Araneae: Arachnida) of Rajasthan With Special Reference to Ranthambore National Park, Rajasthan, India. Baseline Observations on the Common Funnel Web Spider Hippasa agelinoides Simon 1884 (Araneae: Lycosidae). Microhabitat Utilization in Juvenile Deinopis MacLeay, 1839 (Araneae: Deinopidae). A New Species of Tree Dwelling Peucetia Thorell, 1869 from Mumbai, India (Araneae: Oxyopidae). Newly Recorded Genera Yaginumena (Aranae: Theridiidae) from India, With Description of Yaginumena maculosa (Yoshida & Ono, 2000). A New Species of Dictis L. Koch, 1872 (Araneae: Scytodidae) from Mumbai, India. Precinctive Spider Species in India. Cannibalism and Survival Rate of Juvenile Solifugae (Arachnida).